Though North Maharashtra is not so famous for Hilly forts in context of history or battles, still there are forts which claimed to be prominent forts in old times. One of such fort is Rajdehare near Chalisgaon or Nandgaon. You can reach the place via Manmad or via Chalisgaon. Both the railway stations are on central line. From Manmad, you need to travel by bus towards Chalisgaon via Nandgaon. You need to alight at Rohini village. From there, you need to hire rickshaw or jeep to reach to Ganga Ashram. This is the base of Rajdehare fort. Same way , if you coming from Chalisgaon, then you need to travel towards Nandgaon. Alight at Rohini and then move towards Ganga Ashram. Once you reach to Ganga Ashram, you can see the first glimpse of the fort.The route towards the fort is well trodden till a small ashram comes. As shown in the map below, you can access the fort through 2 routes. 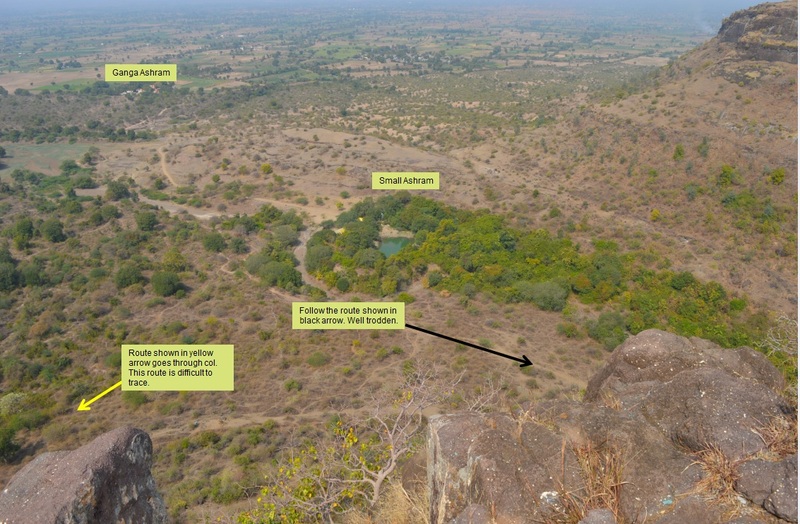 You can either access the fort through reaching the col in between Rajdehare fort and adjacent hill. Route is shown with yellow color arrows in the above picture. This route was common route in older times as proofed by construction built at the entrance(but now entrance is in bad shape). There are small caves at the entrance from this route. Nowadays, this route is completely vanished due to non-usage. You need to struggle a lot to create a route to reach at the top. 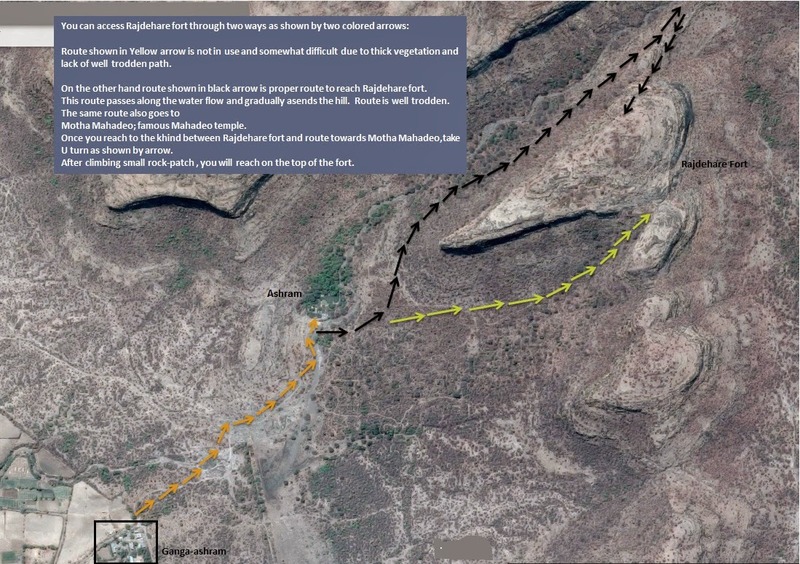 Second and common route(for trekkers) to reach the the fort is passes along the ghal. Route is shown with black color arrows in the above picture.On this route, Rajdehare will always be at your right and water stream to left. At the small ashram , you can ask the route. This route gradually ascends till it reached at a plateau. Beware, there are many cattle routes. always choose the route which ascends. Once you reach to top of the hill, you need to take U turn and after walking 2-3 minutes you will reach to rock patch. Rock patch is easy to cope with. Once climbing it , you will reach to top of the fort. You will see fort walls at this patch. There are few water tanks and fortification structure all over the forts. 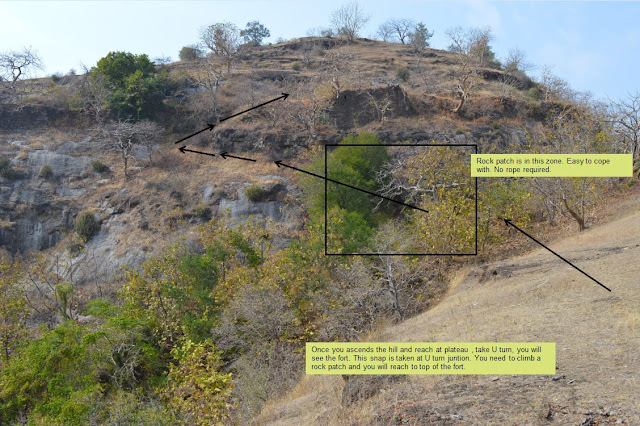 There is also Vinchu kata (Lohgad fame) like structure on the fort. It also have some caves at other entrance. When you follows route with black arrows, at the U turn junction, if you follow straight route, it goes to the Motha Mahadeo temple. This is famous temple of Shiva in the region.